If there ever was a June I was ready for school to get out, it was this one. I’m not quite sure why I was so eager for summer this year. Probably it’s a combination of Morning Rush Fatigue, Too Much on the Schedule, and Overtired Kids. We were all ready for a change of scenery and routine. Mostly, though, I think it’s that I know these seasons when my children will be unencumbered by summer jobs, and when they will still want to spend lots of time hanging out with each other and with me, are rapidly dwindling. After the rush of end-of-school-year activities, it was nice last week to turn the page on the daytimer and see lots of open space. No games or sports practices (but plenty of time to play in the yard), no classes (but lots of room for imagining and dreaming up home science experiments), no concerts or homework or obligatory appointments. There are a few items and deadlines penciled in here and there, but we have a week or two of mostly unscheduled time before jumping into summer plans, and I am hoping to be able to shape my work time around family and play time during these school-less weeks that seem always to fly right by. 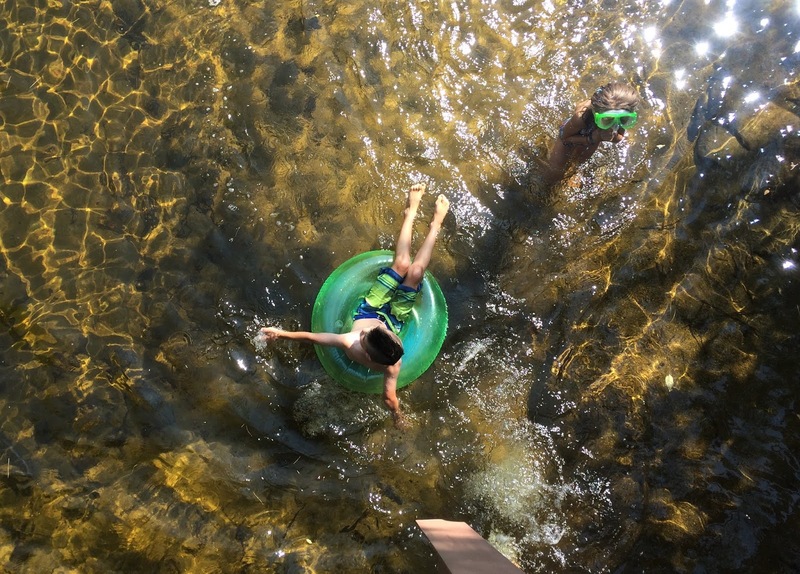 The kids – in their youthful rush to grow up – may not know how fleeting these sweet days of childhood summer are, but they do know the season is short. They haven’t wasted a moment getting to the fun. In the first week of summer vacation, they’ve shared a short hike to a semisecret place with friends, basked in the smoky glow of a backyard fire, paddled kayaks along a river, played with friends, and jumped into the rain-refreshed Ham Branch. The kids have also taken to sleeping in – allowing me precious extra time in the early mornings – and wandering downstairs just in time to watch the day’s first World Cup soccer game. Meals happen when we are hungry, rather than when the clock suggests it’s time to eat. Bedtime has blurred beyond the point of distinction. Next week we will again adopt some semblance of a daily family schedule, but on a summer scale. There will still be plenty of time for going with the flow, between our summer’s bigger plans: the annual trip to the Cape – this year with West Coast cousins who have never been there – an extended hiking trip with friends, and other plans that range from tackling a few more 4,000 footers and riding bikes through wooded trails to jumping into the river on hot afternoons and impromptu outings for ice cream. Somewhere in between, I’ll have deadlines to meet and chores to tackle, but I’m striving for that sweet summer balance between meeting obligations and savoring these long days that pass so quickly. In the meantime, I’m enjoying waking to the strong sunlight and raucous birdsong of summer’s early mornings, the colors of the garden (despite the weeds), the laughter (and, yes, sometimes squabbling) of my children playing in the yard and splashing in the water, fireflies and thunderstorms, and falling asleep to a chorus of frogs singing from the pond and barred owls calling to each other across the just-dark sky. Ahh, summer, thank goodness you’re here. Original content by Meghan McCarthy McPhaul, posted to her blog, Writings From a Full Life. This essay also appears as Meghan's Close to Home column in the June 8, 2018 issue of the Littleton Record. With summer vacation perched promisingly on the horizon, it is school field trip season. This was apparent last week in Boston, where I traveled with my older two children and their class for a full day of city exploration – and where around every corner we found a new group of school kids following some similar agenda. Whether it’s touring the big city or taking a closer look at a local landmark, the kids always look forward to field trips. Partly, I think, this is because they are sprung from the confines and routines of school. Mostly, though, it’s because they get to explore some new place – or a familiar place in a new way. Over the years, the kids have been on an interesting mix of school trips, and I’ve been lucky to tag along on lots of them. Among their favorites they list the Fairbanks Museum in St. Johnsbury, with its engaging planetarium discussions and eclectic range of displays; the state house in Concord, where they sat in the Senate chambers and high-fived the governor; and the Squam Lakes Natural Science Center, where they’ve learned about animal habits and habitats. Last week, my younger daughter’s class visited the Flume Gorge in Franconia Notch State Park. While the Flume is just down the road from school, many of the kids had not been here before the field trip. Caught up in the excitement of being outside on a gorgeous day, the kids seemed somewhat oblivious to the natural beauty that attracts people from all over the world to this place virtually in our back yard. These kids are, after all, growing up surrounded by green things and mountain views. But trips like this give them a chance to learn a bit more about the natural history around them. Between scrambling across the many glacial erratics along the path, feeling the cool mist from water spilling over the 45-foot-high Avalanche Falls, and clambering through the Bear Cave and the Wolf Den, the children paused – ever so briefly – to notice wildflowers blooming on the forest floor, chipmunks scampering near the trail, woodpecker holes drilled in neat rows into a birch tree, and the calling of a barred owl from somewhere nearby. The next day, this chaperone went from meandering through the natural wonders of the Flume to pounding the pavement – and cobblestones – of Bean Town. The Boston trip is an annual tradition at my kids’ school, and one the fifth and sixth graders look forward to all year. It’s a long day – starting with boarding the coach bus just after 6 a.m. and ending some 15 hours later when the bus pulls back into the school lot. 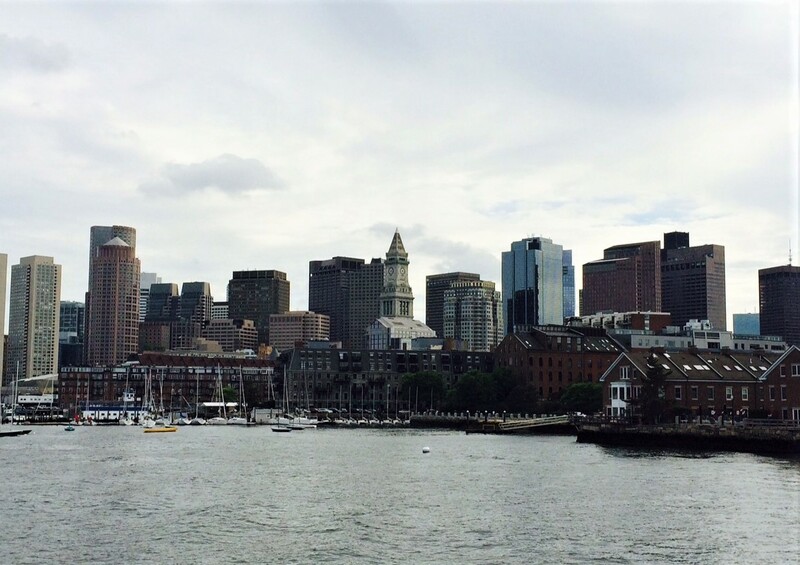 This year’s Boston trip included a walk along the Freedom Trail. The students toured Paul Revere’s house and listened to the tale of Revere’s midnight ride at the Old North Church, wandered through Copp’s Hill Burying Ground, scaled the 294 steps to the top of the Bunker Hill Monument, and even got to climb aboard the USS Constitution before returning to Faneuil Hall Marketplace for dinner. Any one of those places holds enough historical import to fill a book. Beyond the history, though, and the chance to take a first-person look at some of the things they’ve learned at school, the Boston trip is an experience these country kids – and their chaperoning parents – don’t have every day. The busyness and noise of the city, with all the unfamiliar smells and its skyline of tall buildings rather than tall mountains, is so starkly different than the pace of home. Just as city life seems distant from our more rural existence, so does history often seem distant when considered from the pages of a book. But walking along the route of that history makes it a bit more real. It is easier, then, to notice the connections between the past and the present, this place and other places. One of these is that the cornerstone of the Bunker Hill monument was laid by the Marquis de Lafayette in 1825. Lafayette, though French, was a hero of the American Revolutionary War, and when he toured this country five decades after the United States had declared its independence, he was met everywhere he went by adoring Americans. The day after he visited what would become the Bunker Hill monument, Lafayette headed north, to New Hampshire. The mountain that occupies a large portion of the horizon here in Franconia is named in the Marquis’ honor – Mount Lafayette. My children’s school is named for the mountain, which they can see from the playground. Mount Lafayette stands at the northern end of the Franconia Range, which traverses south across Mount Lincoln to reach Mount Liberty and then Mount Flume, down which Flume Brook flows to reach the Flume Gorge. How fun to join field trips to a place close to home and one farther away – places connected, even if obscurely, through the threads of history that wind from city to town, over mountains and along rivers, from long ago to now.